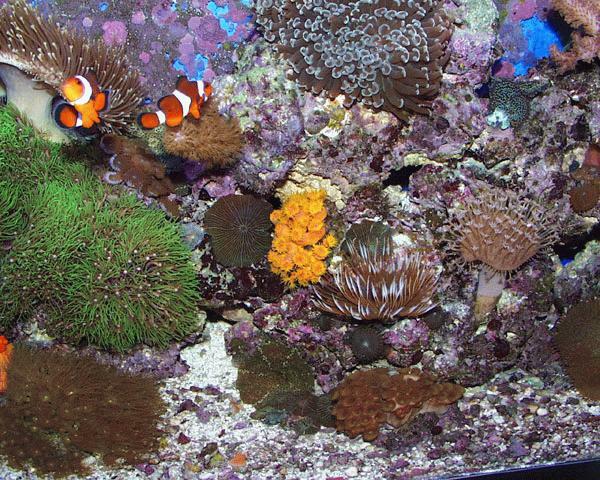 The aquarium featured this month is a first venture into the world of reefkeeping by owners Joe and Beth Ugoretz. This is a first effort at reefkeeping for Joe and Beth, a beginners tank. It was set up in a standard 55-gallon aquarium in January, 1998, using recycled equipment almost exclusively. The lighting for this tank is provided by four 40-watt standard (48-inch) fluorescent tubes  a Coralife actinic/magtinic (100 percent actinic 03), a Coralife 10,000 Kelvin (K) (high intensity daylight) and two Coralife 50/50s (50-percent natural daylight [6000 K], 50 percent actinic 03). The photoperiod is about 12 hours. Biological filtration is provided by 50 pounds of live rock (Tonga branch and Fiji) and a thin layer of aragonite sand as a substrate. Additionally, there is a CPR BakPak skimmer and a Whisper 2 power filter that contains a half cup of ESV granular activated carbon in a fine mesh bag. This photo shows a spotted hawkfish (Cirrhitichthys aprinus) sitting on a branch of green Montipora digitata coral. Two Marineland Penguin powerheads provide circulation. One is placed in a front corner of the tank pointing slightly down and across the front, while the other is at the back, attached directly to a spraybar extending across the back of the tank that is directed slightly toward the surface. Additional circulation is provided by the return from the skimmer and the Whisper 2 power filter (these are in opposite back corners of the tank). Calcium and alkalinity are maintained with ESV B-Ionic (25 milliliters of each of the two parts is added every morning). There is an occasional need for a pH Buffer to remedy a troubling decrease in alkalinity. Three times a week, .5 milliliters of ESV strontium (20-percent solution) and 1 milliliter of ESV potassium iodide (1-percent solution) are added to the tank. All evaporated water is replaced with deionized water made from two Aquarium Pharmaceuticals Tap Water Purifiers that are daisy-chained together. Temperature = 77 to 84 degrees Fahrenheit (varies seasonally). The temperature is monitored with a Lifegard digital thermometer and controlled by one 75-watt Visitherm submersible heater and a room air conditioner in the summer. A close-up of the right side of the aquarium. Note the excellent polyp extension of the various flower animals. phosphate = less than 0.2 milligrams per liter (measured with a SeaTest test kit). 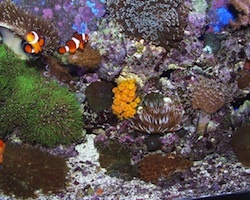 A water change of 20 to 25 percent is performed every four to six weeks, using Instant Ocean salt and deionized water for replacement water. The carbon is changed every four to six weeks, as well. The fish are fed daily with a variety of frozen and dried foods. The Tubastraea is fed a variety of frozen foods three times a week. At the present time, there are only three fish in the tank  a mated pair of true percula clownfish (Amphiprion percula) and a pugnacious, yet appealing, spotted hawkfish (Cirrhitichthys aprinus). 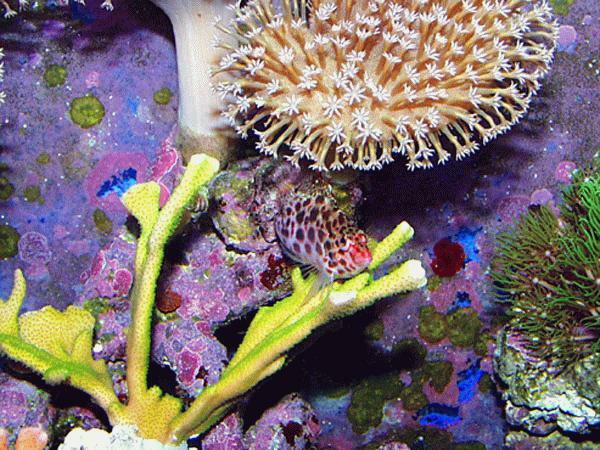 If you look closely in this photo, you can see the spotted hawkfish peering out from among the live rock. Notice also that the Tubastraea sp. has new small polyps developing. This coral must be fed. Nearly all the organisms in this tank are captive-propagated donations from generous hobbyists. 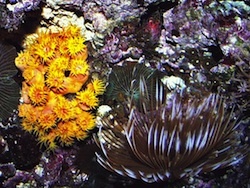 Large Polyp Stony Corals  the tank contains a hammer coral (Euphyllia ancora), an orange sun polyp (Tubastraea sp.) and a Galaxea sp. Leather/soft/mushroom corals in addition to several Sarcophyton sp. 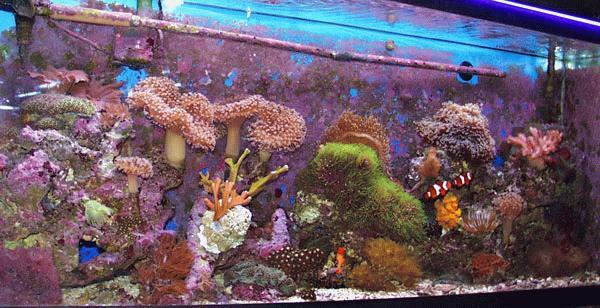 leather corals and a few Sinularia dura, the tank contains a colt coral (Alcyonium sp. 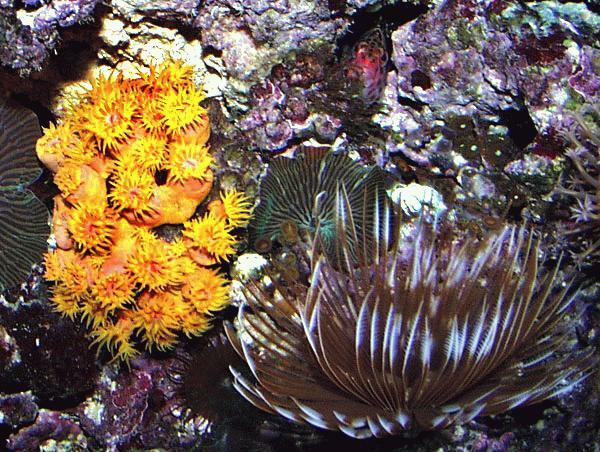 ), several Briareum species, including a rapidly growing colony of green star polyps, and many species of encrusting zoanthid polyps (Palythoa sp., Protopalythoa sp., Zoanthus sp. and Parazoanthus sp.). There are also several corallimorpharians, including Ricordea florida, Discosoma sp. and Rhodactis sp. as well as a small, but growing, Scleronephthya sp. Miscellaneous  there is one Pseudoplexaurella sp. gorgonian and we are currently attempting to keep two fragments of Montipora digitata, in the hope that they will thrive even under the moderate lighting conditions in this tank. One brittle star, two Hawaiian feather dusters, approximately 100 blue-legged hermit crabs and a few dozen Astraea sp. snails also live in this tank.